The SA cycling distribution company has been stocking the option since last month and product and technical manager David Pieterse said they were receiving enquiries on a daily basis from local consumers. “The three-bike rack seems to be the product most are interested in as many riders club together nowadays to make getting to races more cost effective,” he said. The good news, he added, was that the company had plenty of stock to satisfy the demand and customers would be serviced with little delay. “We can guarantee shipment to any destination in South Africa within 24 hours,” he said. While they still stocked the two-bike option, Pieterse said the growing popularity for the three-bike rack was a worldwide trend. 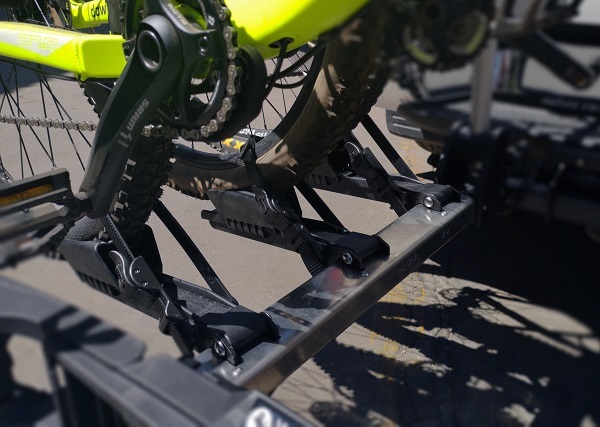 After initially offering the two-bike rack to the southern African market, Positive Sports Solutions went a step further last year to satisfy local demand by introducing the slightly bigger three-bike option. “Besides the cost factor, which sees people clubbing together to get to races, if you go somewhere with your family or friends, the three-bike option makes it ideal to travel together,” said Pieterse. Importantly for those who want to transport equipment is that the three-bike rack is almost identical to its smaller cousin and operates in the same way as the two-bike rack. “People will have no difficulty adapting to the three-bike product because there is little difference, besides, naturally, being slightly bigger,” said Pieterse. “It complies with all the necessary legislation and has been tested in exactly the same way as the two-bike rack. Being TUV-tested means the product has been examined to international standards and has satisfied all the requirements. Translated into English, TUV stands for Technical Inspection Association. He added that the locking system was the same for the bigger rack and that it could carry mountain bikes, road bikes and E-bikes.